So last Thursday I entered a giveaway over at Sarah's blog, Every Streets A Catwalk and I found out that I won! I've never won anything in my life! I won a necklace from a gorgeous online boutique called 'Peaches Boutique' and it came this morning and I was so excited!! Peaches Boutique Is an Independent Online jewelry Boutique. the 12th of July 2011.
kitsch pieces not seen on the high street. and shower you with exclusive, irresistible, show stopping pieces. Our ethos is simple LOVE LIFE, LOVE FASHION, LOVE YOU. They seem so fun and funky- like there jewellry! I love the phone ring and biscuit mirror! It came in this gorgeous pink package with ribbon holding it together with the Boutiques name on it. Once I unraveled it A letter and the item came out. 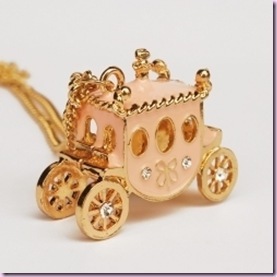 The item is a Princess Carriage Necklace and has a vintage theme about it. It is champagne gold plated and has a long chain of 80m. I am so grateful and can't wait to wear this tomorrow! I urge you all to check out the boutique as they have FREE delivery and a sale on! Omg, it's sooo pretty :D Congrats!